Find an adventure in Blue Ridge, Georgia, with our favorite things to do and outdoor adventures. Where to hike, eat, paddle, raft, bike, or just relax in a cozy cabin rental in this scenic North Georgia mountain town. Blue Ridge is a mountain town that blends big-city sophistication and small-town charm. 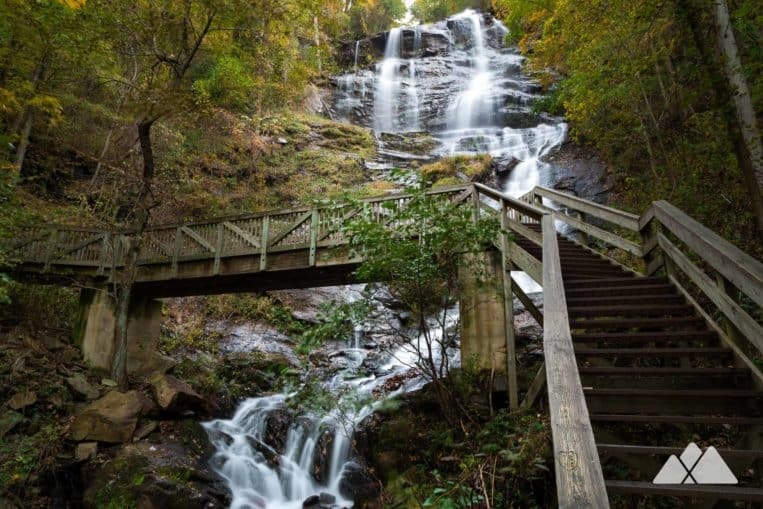 You’ll find some of Georgia’s best hiking, biking, and paddling adventures in a short drive down scenic, winding, classic North Georgia mountain roads. And after your chock-full-of-adventure days, you’ll love the town’s fantastic food scene and abundant upscale, cozy cabins and lodges. Nestled at the southern end of the Appalachians Mountains, the town is surrounded by the outstanding natural beauty of North Georgia. From the lofty peak of Springer Mountain and the beginning of the famed Appalachian Trail, to the roaring waters of Jacks River Falls and the serene banks of the Toccoa River, the area is packed with possibilities for outdoor adventure. But the town isn’t only a great destination for outdoor enthusiasts. The town boasts upscale shopping and dining along its picturesque, vintage streets. An abundance of nearby cabins and luxury rentals offer great lodging options for cozy overnight stays. And the nearby rolling countryside is a bustling agricultural area, with local farms, orchards, and wineries offering fresh, seasonal produce and local wine and ciders. Whether you plan to stay for a day, a weekend or a week, there’s plenty to explore and experience in this historic railroad town. It’s a quick drive from Atlanta (just over 90 minutes) but seemingly worlds away. It’s easy to see why this town is one of North Georgia’s most popular mountain destinations. Hike the Appalachian Trail through the hemlock and rhododendron-filled Three Forks Valley, trekking along the banks of a tumbling, rushing trout creek to one of the most beautiful waterfalls in Georgia, Long Creek Falls. 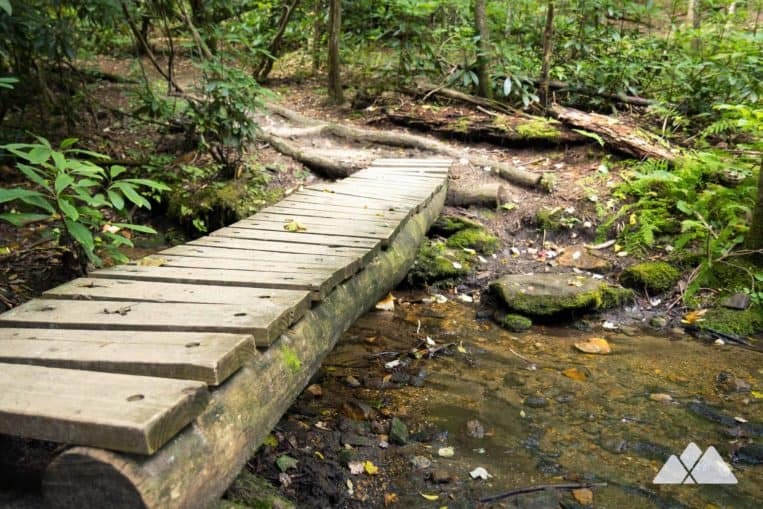 Hike a two mile adventure on the Appalachian Trail, climbing to the Springer Mountain summit and the trail’s southernmost blaze on this famous 2100+ mile trail. You’ll be rewarded with stunning summit views of the surrounding wilderness before retracing your steps through a rocky, boulder-filled forest. Or hike to Springer on the Appalachian Approach Trail from Amicalola Falls for an epic long-distance adventure. Hike to Georgia’s tallest waterfall, and catch beautiful views as the rushing waters of Amicalola Falls drop an epic 730 feet. From the top of the waterfall, you’ll catch sweeping mountain views before descending stairs and landings along the edge of the falls. This area is a popular destination for mountain bikers of all skill levels. The Pinhoti Trail offers over 330 miles of well-maintained trails for biking through beautiful forests and sweeping ridge lines across northern Georgia and Alabama. Or, bike Bear Creek through a lush creek valley, rhododendron-filled forest then climbing to a mountain summit with views of the valley below. Mountain bikers can also enjoy 17 miles of biking trails at the nearby Aska Adventure Trail Area with trails ranging from one to five miles, visiting mountain summits and catching views of Lake Blue Ridge. Spend some time on the beautiful waters around the town, and cool off on a kayak, canoe, SUP or white water raft. Visit the Ocoee Whitewater Center, the site of the 1996 Olympic whitewater course, and take a guided rafting trip down the rushing Ocoee River. You’ll experience some of the most challenging rapids in the South, and you’re pretty much guaranteed to get wet! Or for a more relaxing time on the water, visit Lake Blue Ridge where you can rent kayaks and stand-up paddleboards (SUP) for a leisurely paddle on the lake’s smooth, glassy waters. The nearby Toccoa River also offers plenty of on-water fun with kayak, canoe and tube rentals, perfect for a lazy summer afternoon float. Interested in a night (or a few) out under the stars? The Chattahoochee National Forest offers some amazing places to camp and backpack. 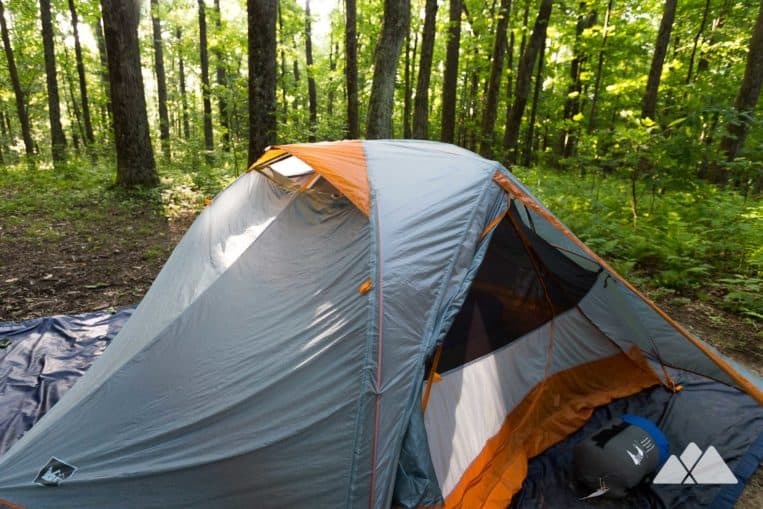 From remote, primitive backcountry sites on the Appalachian Trail to well-equipped campgrounds with comfy amenities, there’s no shortage of amazing places to camp and backpack near the town. One of our all-time favorite places for backpacking and camping near town is the Three Forks valley. Three trout streams converge at Three Forks, a lush, shade cooled, waterfall-filled retreat accessed only by a primitive, one-lane gravel forest road. Check out our Three Forks camping and backpacking guide for campsite information, maps, directions and inspiration. Looking for something a little less rustic? Camp at one of 70 lakeside campsites at Fort Mountain State Park. The sites feature electric and water hookups, fire rings, picnic tables and comfort stations. Check out our Fort Mountain State Park Destination Guide for campsite info, and our favorite hiking, biking and paddling adventures at the park. Wondering what to pack for a great camping adventure? Our camping gear list features our favorite tents, sleeping bags, furniture, cookware, and campsite essentials. Southern Comfort Cabin Rentals offers a large variety of cabins to accommodate any size group. From cozy mountaintop cabins to creekside retreats and downtown cottages, Southern Comfort Cabin Rentals has a wide selection of cabins and homes to choose from. 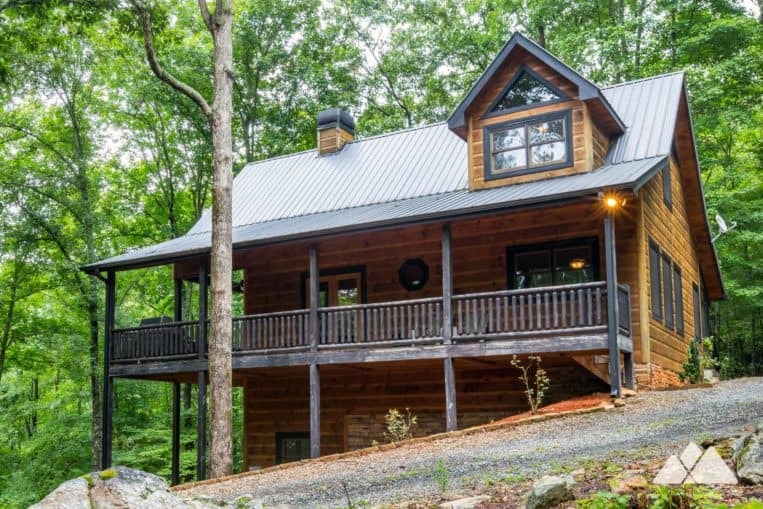 Hawks Ridge Cabin is a beautiful two bed, two bath cabin set just off the rushing Toccoa River. The cabin is only 15 minutes from town, but its secluded setting gives the feeling of a far-off mountain retreat. Stay close to the adventure at nearby Fort Mountain State Park, an enormous outdoor playground with fantastic hiking trails, mountain biking trails, a sandy beach and paddling on a mountaintop lake. Fort Mountain’s newly renovated cottages feature rustic lakehouse charm and modern furnishings, nestled lakeside in a pine and hardwood forest. After working up an appetite exploring the surrounding outdoor wonderland, head into town and for an inspired meal at one of the many fantastic eateries. Blue Ridge features upscale cuisine, casual eats, pub fare and specialty shops serving up sweets & treats. Many of the restaurants take full advantage of the area’s abundant local produce, locally-brewed craft beers and wines, and other locally-sourced meat, grains, and ingredients. One of our favorites for breakfast is the Blue Ridge Grocery. 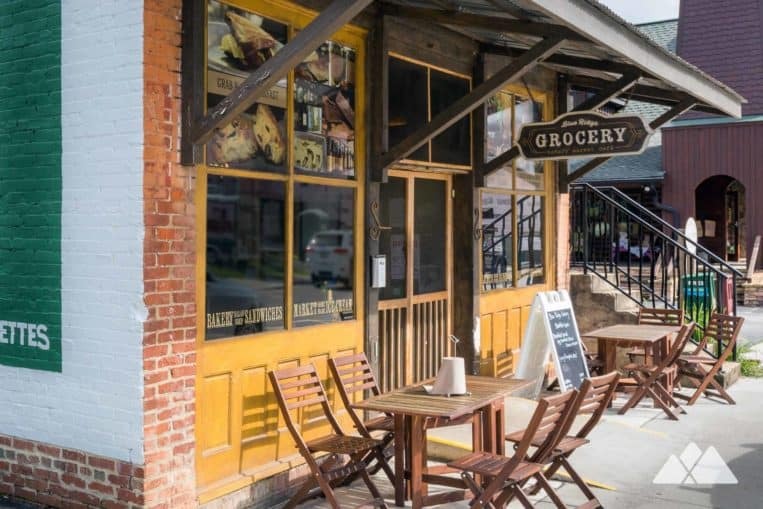 This rustic grocery and casual restaurant serves house-made baked goods, breakfast staples, sandwiches and fantastic lattes and coffee drinks. A few of our favorites: the sourdough egg and cheese sandwich, and the house-made granola topped with Atlanta Fresh Greek Yogurt. It’s the perfect way to start the day, and gear up for the trail (or get it to go, for a fantastic picnic on your day’s adventures). For an upscale (and exceptionally tasty!) lunch or dinner, visit Harvest on Main. The restaurant’s rustic-modern atmosphere, soaring ceilings, and expertly crafted food make it one of the town’s most upscale dining options. With expert preparation and locally sourced meats and produce, Harvest on Main blends rustic fare with a sophisticated palate. For a more casual dining experience, try Masseria Kitchen and Bar, sister restaurant to Harvest on Main. Masseria serves gourmet pizza, salads, sandwiches, and house-made pasta entrees. A must-try is the grilled caesar, an especially generous (and hearty) dish of grilled romaine, hickory-smoked ricotta, tomato, olives, reggiano and garlic caesar dressing. It’s simply amazing. Make a stop at Fightingtown Tavern for some local, Georgia-brewed draft beer and casual, scratch-made pub fare. 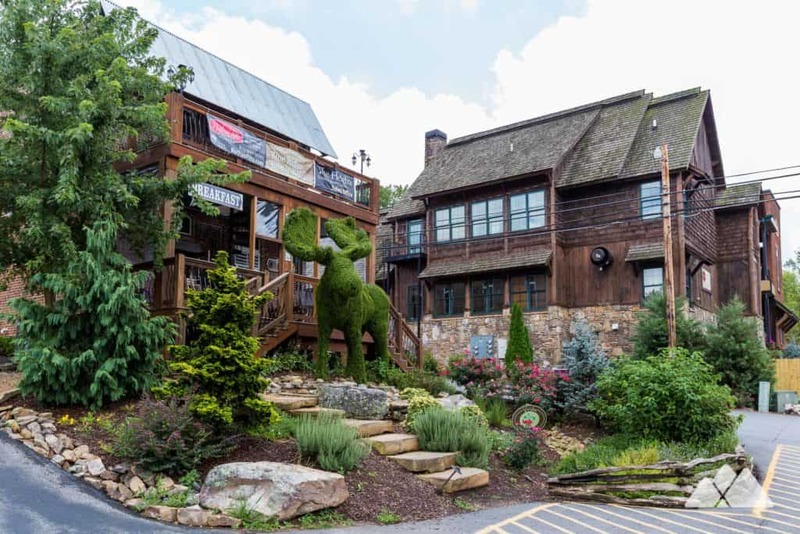 The tavern’s lively atmosphere, large outdoor patio, billiards and rock-music theme make it one of our favorite places to chill after a day on the trail or out on the water.